Contact Road Superintendent Bob Snyder at the the Service Department at (614) 679-3036 or SnyderB@jacksontwp.org. I want to have my front yard ditch repaired or install tile? Depending on existing conditions, the Township may be able to install drainage tile purchased by the property owner. The Township’s standard for yard tile/ditch pipe is 12” N-12 polyethylene pipe. Each property must be reviewed and approved by the Township Road Superintendent. Driveway and Tile Application Form. A streetlight is out or not working properly? The Township leases more than 100 streetlights from AEP on various roads throughout the community. If you notice a light that is not working, it can be reported directly to AEP through their online reporting form at https://www.appalachianpower.com/outages/report/streetlightproblem.aspx. The pipe under my driveway is broken? The Township may be able to install a new pipe under your driveway. The Township’s standard for driveway pipe is 12” concrete pipe and all materials are purchased by the property owner. Call the Service Department at (614) 679-3036 to schedule an inspection or e-mail Road Superintendent Bob Snyder at SnyderB@jacksontwp.org. The catch-basin next to the road is overflowing? The basin may be plugged or the drainage pipes broken. Call the Service Department immediately to inspect and repair the problem. There is a dead animal on the road? The Township can remove dead animals along Township roads. Call the ODOT Service Garage on Haughn Road at (614) 875-3336 for removal of animals on state highways (SR-104, SR-665 or US-62) or Franklin County Engineers (614) 525-3072 for removal of dead animals on county roads (Holton, White, Hoover, Orders). Where can I get a reflective address marker? The Township Administration Office sells the green, reflective signs with the customized numbers for approximately $7. Contact the Township Office at (614) 875-2742 or e-mail Tonya Ralston at tonya@jacksontwp.org. My mailbox was hit by a snowplow? Occasionally, the force of snow coming off the road may break a mailbox. If the Township broke your mailbox, we will make efforts to promptly replace your mailbox with a standard post and box. Sometimes, however, other crews from the county, state or city may have damaged your box. In any event, contact the Township Offices at (614) 875-2742 if your mailbox is damaged during a snow event. When & How do you spray for mosquitoes? 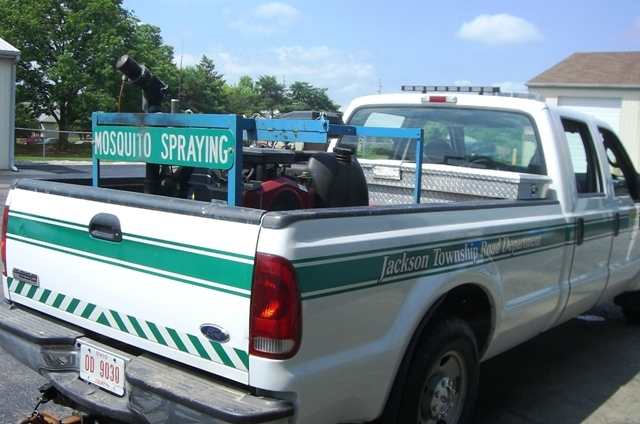 The Township Service Department does mosquito-control fogging each Tuesday and Thursday evening from 9 p.m. – midnight as this is the time frame when most of the population is indoors and mosquitoes are most active. The Township will routinely treat the more densely populated subdivisions and rural areas. Mosquito spraying will not take place if it is raining or if the wind speed is 10 mph or greater. The product used by the Township (Duet by Clarke Mosquito Products) is not considered harmful to humans, however people with breathing difficulties are advised to keep their windows closed. The Township’s equipment is calibrated by factory technicians each season, and all Township personnel are state certified applicators. The Township also has contractual agreements in place to allow the Franklin County Board of Health to monitor, trap and treat mosquito problems that may appear in the Township. Yes, the Jackson Township Service Department schedules complimentary leaf pick up services throughout November. Exact schedules depend on weather and when leaves fall. Residents are asked to rake leaves to the edge of the road, preferably on the berm, being careful not to block storm water drainage inlets. Branches will not be accepted. 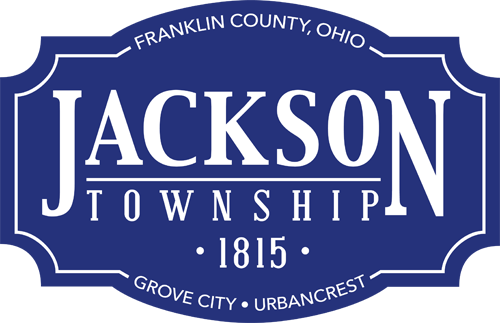 Residential subdivisions covered by Jackson Township include Anglebrook, Briarwood Hills, Casa Farms, Deer Trail Estates, Emersonia, Geyerwood, Grubb Farms, Lynnbrook, Mayfair Park, Robin Estates, Rocky Creek and Southern Grove. For more information, call (614) 679-3036 or (614) 875-2742.